Proceedings of the Fourteenth Vertebrate Pest Conference, (VPC-1990 Published at the University of California, Davis, July, 1990. 372 pp. 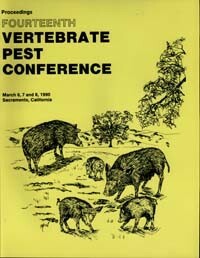 Description: Proceedings of the 14th Vertebrate Pest Conference March 6-8 1990 Sacremento, CA, arranged by the Vertebrate Pest Council of the Vertebrate Pest Conference Editor Lewis R. Davis, Rex E. Marsh and Assistant Editor Dorothy E. Beadle. Description: A Comparison of Three Traps for Removal of Columbian Ground Squirrels, Rodent Problems in Range Rehabilitation and Responses of Captive Coyotes to Chemical Attractants.